Breakthrough In Atomic Memory: Writing Data Onto Single Atoms, Scientists Store The Longest Text Yet : All Tech Considered With atomic memory technology, little patterns of atoms can be arranged to represent English characters, fitting the content of more than a billion books onto the surface of a stamp. This animated video explains the new breakthrough in atomic-level data storage. A group of nano-scientists has discovered a way to arrange individual atoms to store and rewrite data 500 times more efficiently than the best hard drives on the market. A team of researchers from the Netherlands, Portugal and Spain has made a major breakthrough in so-called atomic memory — an approach that stores one bit of data on each atom with a goal of creating a new kind of tiny data storage device of the future. With this technology, little patterns of atoms can be arranged to represent English characters, fitting the content of more than a billion books onto the surface of a stamp. Common modern-day data storage approaches — solid-state drive and hard-disk drive — rely on electric circuits or magnetic metal plates to record and reproduce data, and each bit (aka the smallest unit) of data is represented by thousands of atoms. 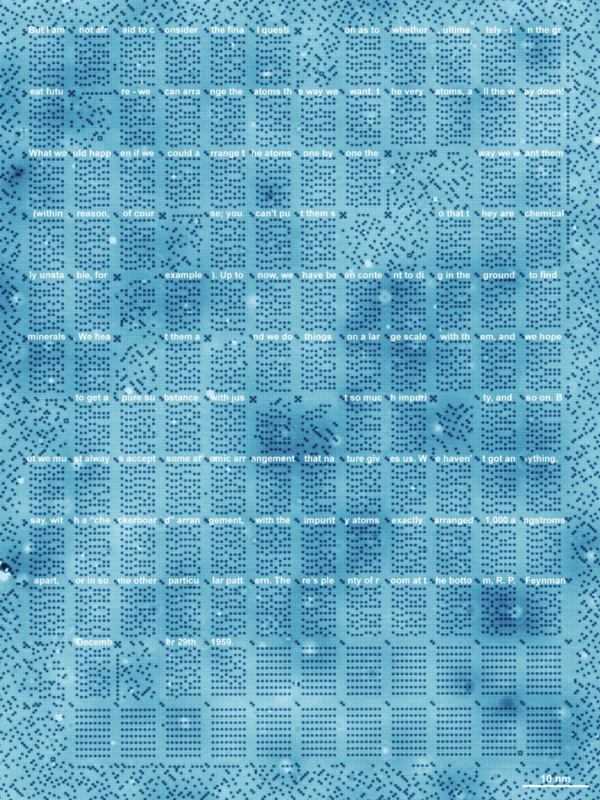 Atomic memory shrinks the number of atoms required for a bit of data to one. "There is plenty of room at the bottom": An excerpt from a landmark 1959 lecture by physicist Richard Feynman is written on a sheet of copper with chlorine atoms. "But I am not afraid to consider the final question as to whether, ultimately — in the great future — we can arrange the atoms the way we want; the very atoms, all the way down!" "It's definitely the first demonstration of its kind," says Sebastian Loth, a physicist at the Max Planck Institute for the Structure and Dynamics Matter, who was not involved with the study. In fact, it's a first in several ways. For one, it's the first atomic-level storage device capable of holding a whole paragraph of text. A number of researchers have been able to reposition atoms one at a time to make patterns, but Otte's group is the first to show that the process can be "automated and sped up enough to write a thousand characters of information," says Chris Lutz at IBM Research, who also was not involved with the study. According to Lutz, IBM researchers had previously managed only to reposition 12 atoms. Loth says his lab typically deals only with 10 to 20 atoms at a time. Otte says his approach also produced the first rewritable atomic-scale memory storage device. According to Sanders, old technologies often evaporated the atoms, rendering the storage device quite temporary. Previous attempts at atomic pattern-making largely involved pushing atoms around on a largely empty surface, similar to spreading sand on a piece of paper. What Otte's group did was manipulate the empty spaces, similar to dragging a finger in the sand, pushing sand away and creating gaps. Just as sand drawings on a beach are much more likely to stay together than sand drawings on a piece of paper, atomic patterns created with a lack of particles are more stable than atomic patterns created with a small number of particles on an otherwise empty surface. And, by pure luck, Otte's group discovered that chlorine atoms on a copper surface in particular are an especially stable combination. With them, Otte and his team were able to make atomic patterns that stuck for days. "What I like about this experiment," Loth says, "is that if you can control 10,000 atoms over the course of days, then you can control individual atoms over the course of years." Still, there are many challenges to overcome before the discovery gains broad use. The atomic memory device, as it stands now, is too slow for practical applications, scientists say. For example, it would take about a year and half to load a three-minute pop song from such a device. Plus, the current atomic memory devices have very specific temperature requirements. They must be operated in a vacuum container at -320 degrees Fahrenheit, a temperature so low that nitrogen gas liquefies. There are also restrictions presented by the reliance on an electrified needle — called a scanning tunneling microscope – to manipulate atoms. "I don't think this particular demonstration will end up in a commercialized data storage unit in the next few years," Loth says, but "it points to a technological possibility that is very real."